It’s our goal to unlock elearning with new technology, better ways to purchase content and great service, and this award demonstrates that we’re on the right track. 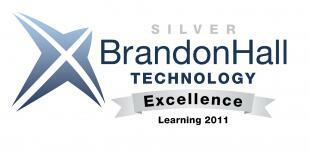 Corporate learning officers rely on Brandon Hall’s judgement and we’re thrilled to have their seal of approval. eLearning buyers visit OpenSesame to shop from thousands of courses, read customer reviews, watch previews and make purchases instantly. Our SCORM-compatible video player enables any video file to be displayed and tracked in enterprise learning management systems (LMS) – unlocking one more kind of content for use in corporate training programs. This unprecedented innovation makes it possible to employ video files as courses in an LMS, with full tracking and bookmarking features in place. Brandon-Hall is an industry-leading performance and learning management analysis firm, providing insightful and widely used analysis of technology tools and service providers for the enterprise market. A panel of veteran, independent senior judges evaluated the entries along with Brandon Hall Group’s industry expert analysts and leadership. Interested to see how the SCORM video player works? Let me know in the comments and I’ll set up a demo!